My review of Alison Littlewood’s second novel, ‘Path Of Needles‘ is now available over on the BFS website. Anyone who likes horror/crime fiction with a fairy tale twist should definitely give this one a go. My review of the newly updated edition of Kim Newman’s 1991 horror novel, Jago, is now online over at the BFS. Due to unforseen circumstances, Angelic Knight Press have reset the release date for their upcoming ‘No Place Like Home‘ anthology to 13th August, which means you’ll just have to wait a couple more months to get your hands on this collection of nightmarish visions of the near future. In the meantime though, they’ve released this snazzy postcard as a reminder for the new release date, and will be distributing promotional material whilst at the World Horror Convention (13-16th June), including posters, bookmarks and even t-shirts. Update: The anthology is now pushed back to a September launch. Exact date TBC. Recently established publishing outfit ‘Forgotten Tomb‘ are a small press with big ambitions, who recently invited me to submit to one of their first forays into the world of anthologies. 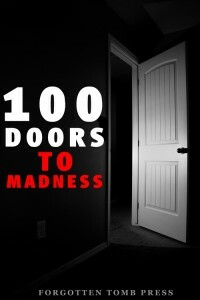 My piece, ‘Rank & Defile‘, has now been accepted into their ‘100 Doors To Madness‘ anthology, which aims to celebrate the diversity of the horror genre by providing 100 original scares from 100 different authors in the form of flash/micro fiction. They’ve had the great idea of keeping the Table of Contents as a live document, so anyone wanting to keep track with whose getting involved can do so over at the FT website link above. 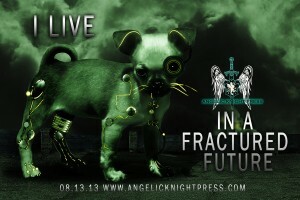 Publication is planned for September 2013, but the anthology may be out earlier if the 100 slots become filled before then. The anthology should be available from all the usual online retailers and I’ll put up more details nearer the time. Until then here’s a preview of the cover artwork to whet your appetite. Those lovely people over at Cyber Launch Party are spending today celebrating the release of the ‘Shadow Masters‘ anthology. Several of the included authors will be stopping by over the course of the day, to spend time giving people a bit more info about both themselves and where the idea for their story in the anthology originally came from. You can check out what each of us had to say on the origins of their particular horror at either the blogspot or the Facebook event page.